As you probably have gathered from my tepid review of director Terrence Malick's last film, The Tree of Life, I'm not exactly the president of his fan club. While I am in awe of the gorgeous cinematography in his films and his unmatched ability to capture the beauty in simplicity, I remain wholly unaffected by his storytelling. But TO THE WONDER, while it still has a few of his trademarks, has a different effect than its predecessor. With themes involving deteriorated relationships, false assimilation and the absolution of emotions, the film aims to resonate on a deeper level. The characters are people you would know, going through situations you might have experienced. However, the characters never actually speak to one another, you know, out loud. Much of the film is in voice-over narration, in three different languages (Spanish, French and English) with subtitles, and there are three somewhat intertwining stories that often vacillate in time. They often react operatically, silently moving toward or drifting from the action around them with giant gestures or lingering gazes. This forces them to mime their emotions as we hear their internal struggle and interpretation of the events and feelings around them. In some scenes this is effective, in others it isn't. And, like many Malick films, it is so arresting to look at you almost forget to listen to the dialogue (or, in this case, you may forget to stare at the dialogue). But it takes more than beautiful Kodak moments and lingering themes to sell a movie. The performances must be there. Which brings us to Ben Affleck who plays Neil, the main character around whom each story revolves. This is a complete departure from Affleck's typical brooding and above-it-all type, and he appears visibly uncomfortable in Neil's skin. Neil is a somewhat sullen blue-collar worker, who revels in complacency. He is married to Marina (Olga Kurylenko), a French woman who comes to the U.S. on a VISA marriage proposal. It's hard to say that she falls in love with Neil, but she respectfully feels very deeply for him. And she tries her hardest to love him enough for the both of them. That quickly proves futile when she realizes that Neil is completely detached from emotion; she is in the relationship by herself. 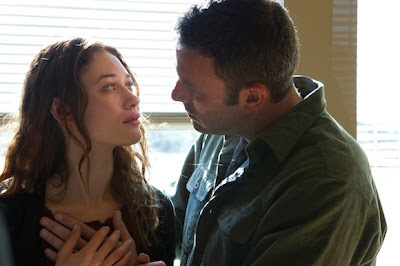 As her frustration builds, exquisitely portrayed by Kurylenko, Neil becomes farther distant. 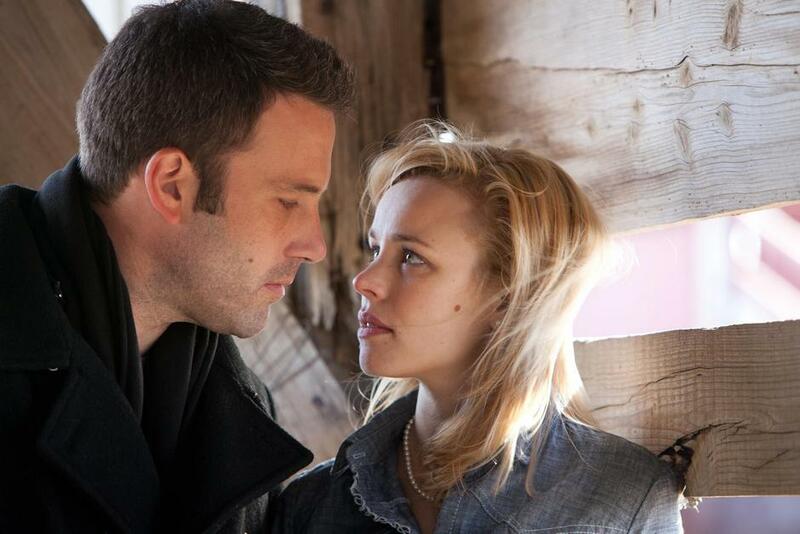 But, rather than humanizing Neil, Affleck comes across blank and at times not present in the scene. It's especially difficult to watch in scenes he shares with Kurylenko, who can literally be shot strictly from the neck up and compel you more than Affleck's entire 6-foot-something frame. Her face is so expressive it's hard not to fall for Marina, even when she falters. Meanwhile, Affleck remains exceedingly vacant the whole movie. In fact, the one time Affleck really comes alive in the movie is during a scene which calls for anger over Marina's betrayal. You can almost see him channel The Town then. But then he quickly recoils back to being stoic. Though, in his defense, Neil isn't really written with a whole lot of depth. For a character who really circumvents the movie, Malick didn't offer much of an anchor or a reason to focus your attention on him. I'm not sure whether that was intentional, or whether it mattered more how other characters fed off his energy, how they reacted to him and what they became as a result of it. In the end, he comes off as merely a centerpiece in the middle of a much more interesting puzzle. Take, for instance, Neil's brief encounter with Jane (Rachel McAdams), a woman with whom he finds a flicker of a connection once Marina is out of the picture. She inexplicably falls for him, in a way which is not reciprocated on any profound level, which of course disappoints her. While McAdams is serviceable in the role, Jane comes across as a distraction to both Neil and the movie. She doesn't elevate the film, and fails to even stir Neil's flaws. Another character who doesn't exactly connect with the rest of the film is Father Quitana (portrayed as well as one could by Javier Bardem). He is another one in the movie whose story is theoretically bare, but Bardem makes him the most interesting to watch. He embodies the sullenness of Neil, the overwhelming frustration of Marina and the emptiness of Jane into one character, a priest, who's consumed so much of everyone else's sins and confessions that he lost sense of himself. He wears their every emotion on his face, without saying one word. Quitana's internal struggle becomes immediately clear in Bardem's performance. Even with the persistent voice-over narration, Quitana becomes a fully realized character. It's a shame the rest of the movie isn't as effective. The intention is there, and the performances (sans Affleck) are at the very least committed. But the film could have benefited from tighter editing and spoken dialogue (there is one scene of spoken dialogue between Marina and a fellow import that is so evocative but sadly too brief), which also could have made certain scenes more trenchant. Though Malick has a knack for enhancing the mood of each scene with stunning visual effects, it's not enough to boost the film. Ultimately, TO THE WONDER warily becomes a very pretty mash-up of emotion that never fully connects with the audience. I just can't get into Malick's films either. It's a shame, because he always casts such great actors.